For as long as she can remember, Trisha Prabhu has been fascinated with the inner workings of the brain. In the fall of 2013, after hearing about a young girl’s suicide because of cyberbullying, she set out to design a long-term solution. Her efforts resulted in Rethink, a product that gives adolescents trying to post offensive messages on social media a second chance to reconsider their decisions. Winning a spot as a Google Science Fair 2014 Global Finalist and first prize at the PowerPitch Competition at 1871, Chicago’s technology and entrepreneurial hub, Rethink has been covered by Business Insider, The International Business Times, The Huffington Post, and several other media outlets. Trisha currently holds a provisional patent with the US Patent and Trademark Office for her Rethink idea. 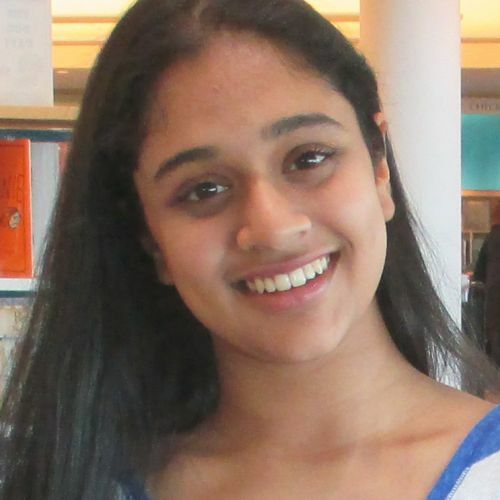 Prior to her Rethink project, Trisha conducted research on how the brain plays a role in the cognitive distraction that causes distracted driving, for which she was awarded a Gold Medal by the Illinois Junior Academy of Science. An author of four books, Trisha is an advocate for STEM in education and has spoken at education and technology conferences in the Chicagoland area. She was also named Chicago’s Financial Literacy Ambassador by the Federal Reserve Bank of Chicago. Trisha is a 14 year-old high school freshman.